Kenyan MP shot dead in centre of Nairobi. A prominent Kenyan MP was shot dead along with two bodyguards and a driver in the centre of the capital Nairobi in the early hours of Saturday, police and medics said. Detectives said George Muchai, a member of Kenya’s governing Jubilee coalition, was returning home after meeting family members in a restaurant when the attack took place in Nairobi’s city centre. 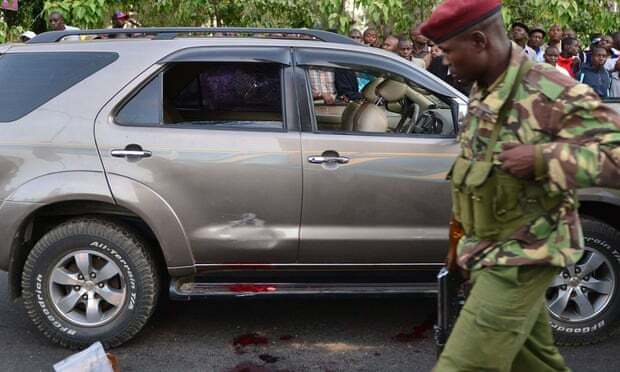 “The MP was coming from a family meeting in Westlands and was headed home,” a police officer said, adding the MP’s car had slowed down at a roundabout when another car rammed it from the side. “Masked gunmen emerged and opened fire at them, killing all of them at once. They also stole a briefcase and two pistols from the bodyguards,” the officer said. “Our medics who responded to the early morning cold-blooded murder found no signs of life in all the four,” said Fred Majiwa, a spokesman for St John Ambulance. “It is something we can’t rule out at all. It seems to us like something that was well planned,” said the officer, who asked not to be named.